on and as co-creator and vocal star of “Lady and the Tramp” was the first person to win a lawsuit against Disney, Lee was a trailblazer! Spider Saloff pays homage to the smoldering understated style of Peggy Lee, tracing her story from her humble beginnings through the glamour of the 1950’s and 60’s and her continued chart breaking recordings. 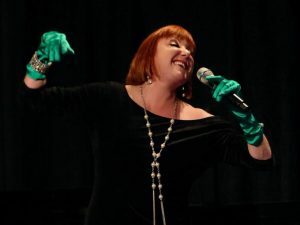 The concert includes her classic jazz hits as well her pop music classics. Saloff presents all of this with her unique comic wit and a contemporary twist that will appeal to audiences of all ages! The Cool Heat of Peggy Lee can be presented with piano, bass and voice, or with quartet or quintet.